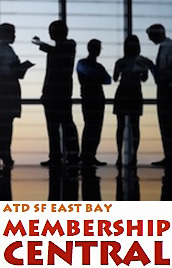 ATD SF East Bay - SAN RAMON | Luanne Stephenson: "Career RX: Re-Focus for Renewed or Greater Career Success"
SAN RAMON | Luanne Stephenson: "Career RX: Re-Focus for Renewed or Greater Career Success"
When you’re busy, it’s easy to ignore career planning, especially when things are going well. However, at least once a year you need to refine your career strategy to keep things on track and to take things to the next level. If you’re in transition, you know you need to do some career management work, but what if you’re in a job and things are going alright (if not spectacularly) do you know what’s ahead for you? Do you want influence over your future? This is when it's time to take a "helicopter view" of your career strategy, determine the right balance of actions to take, and then move forward with renewed energy, focus and clarity. This presentation will provide you with methods for bench-marking your career and refocusing your strategy, and the tools professional coaches use to help elevate you to the next step in your career or business. By taking time to do some analysis, you will identify your strengths, the areas that need more attention, and actions to take for career success in 2016 and beyond! Get motivated to take the next step! Whether you're confident or concerned about your career at this stage, developing your career strategy to take you to the next stage is how you get there. Invest in yourself by joining us for a couple hours of great career coaching. You're invited!